I'm happy to say I think I've finally found a good balance of letting go of control and encouraging healthy eating habits through fun and education not coercion. For the record, I, by no means, have children who eat every vegetable offered to them. In fact, no matter how many times I have cooked broccoli, I know, deep down, both of my kids hate it. I will admit I had some help along the way finding this new peace. I took a wonderful course by Nina Ayd Johanson (MS, CCC-SLP CEIM, CHHP) entitled The AEIOU Systematic Approach to Pediatric Feeding. It was an amazing refresher for everything feeding related (including sensory issues). But more importantly, it was precisely what I needed at the time in regards to my son's own picky eating. While I don't want to give too much away from the course, I do want to tell you what the big take home message was for me, personally. I realized I had, unknowingly, created an environment of stress in regards to eating/mealtime for my son. The more I worried about what my son ate, the more he refused the foods I presented. It wasn't until I decided it was time to finally let go of control and be intentional about creating an atmosphere of joy around the dinner table, that my son started eating well again. It took almost a full year to regain his trust in the kitchen. I am happy to say I actually enjoy mealtime with my kids again instead of dreading our nightly food battles. Since new foods can be scary for children, I consciously try to ease the anxiety and fear through fun. Here are a few games we play around the dinner table that have been helpful for us. Our favorite game is talking about which foods do what for the body. (i.e. "Carrots make your eyes see really, really well!" and "Protein makes your muscles grow super strong!"). A great ice breaker, when you can sense your child is nervous about what is on the plate, is to describe the food to the in words. It's like giving them a hint about what it's going to be like if they take a bite. Talk to them about the color, taste and the texture. Kids are afraid of the unknown so this works well. For example, "These sweet potatoes are mushy but they have yummy butter inside." "The skin on the chicken is really crispy today." "Cucumbers make a loud crunchy sound when you bite them, listen!" Cooking together also eases anxiety when introducing new foods. (Use simple age-appropriate tasks. Pre-measuring ingredients prior and letting them pour them into the pot, mixing, straining are all good ideas. If its taco night, let them assemble the ingredients of their choice on their own plate. Use their sense of smell if they are cooking with you. The olfactory system is closely tied to how we experience taste. If they become familiar with the way that something smells, they might be so inclined to taste it. Did you know that it takes anywhere from 10-15 trials for kids to accept a new food? Actually, some speech therapists have told me its even more than that! So if you're in the throes of nightly food battles, ask yourself what type of environment you are creating around the dinner table. I think too easily snack foods get excused from needing to be nutritious. We work hard enough to get a meal on the table three times a day, right? Who has time to make healthy snacks too? I think that's why packaged foods have become the norm for snack time - no work and easy access. Well, friends, I was thinking of you when I wrote compiled this list of my favorite snack foods. Because I'm a busy mom too! Here is a list of my favorite, readily accessible, no prep, healthy and nutritious snacks. These snacks are either nutrient dense and/or high in protein and healthy fats in order to keep your child satisfied and to fuel their growing brains and bodies, not give them a sugar crash. I promise your kids are going to actually love them! 1. Organic blueberries: Blueberries are full of antioxidants and they are so good for the developing brain! You can buy them fresh or frozen. The benefit of buying frozen is that you get more for your money (my kids eat a LOT of blueberries). Kids can enjoy them by themselves as a quick snack, blended into smoothies or in their morning oatmeal. 2. Wild-caught Smoked Salmon- You can find these near the fish section of your grocery store. My kids like to eat these salmon slices with a smear of cream cheese. Sometimes we layer cream cheese and salmon on top of a cucumber slice or a cracker. The human brain is made up of mostly fat (DHA/EPA/Omega-3 fatty acids, cholesterol, polysaturated fats) (13) and since your babies brain will DOUBLE in size from birth to age 2, they literally NEED these fats in their diet in order for healthy brain development to occur! The AMDR for fat for children ages 1-3 years is 30-40% of calories. (11) and human breast milk averages around 50-60% fat content (12). Do you feel your child is consuming an adequate amount of healthy fats? Rich in Omega 3 Fatty acids (DHA and EPA) - our kids (constantly growing) brains require these essential fatty acids to build neural connections! Both fatty fish and fish oil have been found to reduce depressive symptoms, protect fetal brain health during pregnancy, decrease anxiety, slow age-related memory loss and lower the risk of dementia. 3. Cashews: Of all the nuts I've offered, this is the one that my kids prefer the most. I knew they were healthy but I honestly can't believe how many health benefits they provide (see below). They are a protein and a healthy fat mixed into one, easy-to-carry-in-your-diaper-bag, dream! I love that they are basically mess free. 4. Almond butter and bananas: An excellent source of protein AND healthy fats paired with a tried and true kid approved fruit! Can it get any better? 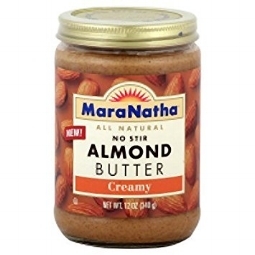 This is one of my favorite snacks for myself when I'm craving something sweet and my kids love it too. You can cut the bananas in slices and dab the almond butter on each one or your kids can dip the banana themselves. I love to add almond butter in my oatmeal for some extra protein or as a treat I like to eat it on a slice of sprouted toast with some honey. So easy and so good for your kiddos! good for your brain: contain two vital brain nutrients, riboflavin and L-carnitine, which have been shown to increase brain activity, resulting in new neural pathways and a decreased occurrence of Alzheimer’s disease. Studies have shown that almonds in the diet, as well as almond oil, is nutritive to the overall health and functioning of the nervous system. heart health - mono-unsaturated fats, protein and potassium contained in almonds are all instrumental in heart health. Vitamin E is an effective antioxidant and also reduces the risk of heart diseases, while the presence of magnesium in almonds can help avoid heart attacks. Furthermore, the flavonoids in the skin of almonds combines with Vitamin E to form a powerful shield against artery wall damage. 5. Seaweed Snacks: Asian cultures have long enjoyed the nutritional benefits of seaweed. It contains a massive variety of health-promoting components as compared to the majority of other plant and animal-based foods. 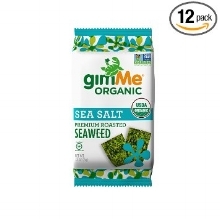 (1) My kids and I happen to love the flavor of these seaweed snacks. They are so easy to bring along in car rides and for keeping kids busy while you cook dinner. The sesame flavor is our personal favorite. 6. Applegate Nitrate Free Roasted Turkey: We make a lot of turkey rolls with these in our household! I love that these are nitrate free (nitrates have been linked to cancer), organic and the turkeys are humanely raised. A quick, easy and health protein for snacks! Add a little organic mayonnaise or mustard inside to give it more of a sand-which taste. 7. Frozen organic peas: One of my mom friends told me how her twin boys love frozen peas and I couldn't believe it until I tried it on my own kids and they got thumbs up all around. Yes, I am talking straight out of the freezer! I love having these in the freezer for when my daughter is hungry but dinner is still cooking. Time for a few frozen peas to take the edge off and keep those little hands busy! They are a plant based protein, can you beat that? 8. Organic raisins: These are so great to keep in your diaper bag and they are essentially mess free. I think you'll be surprised to find out the plethora of health benefits behind raisins! So there you go mamas, you can't make excuses now about offering junk just because it's easy. So get to the store and start filling those tummies full of what is going to fuel growing bodies and brains!! If you have a chance, check out this wonderful article on dietary fats for children! Check out this article about healthy fats for kids too!